What Is a Geriatric Specialist and Who Needs One? We are living longer. The dramatic increase in life expectancy is one of the most notable achievements of the 20th century, with a ten-fold increase in the number of Americans over the age of 65. By 2060, people over 65 will number about 98 million, more than twice the number today, and will represent almost 22% of the population. And those over 85 constitute the fastest-growing segment of Americans. Numbering around 4 million today, there may be as many as 19 million of the “oldest old” by 2050. The longer we live, the more likely we are to be dealing with multiple medical conditions such as heart disease, diabetes, arthritis, Alzheimer’s disease, or high blood pressure. According to the Alliance for Aging Research, the average 75-year old has three chronic medical conditions and uses five prescription drugs, as well as multiple over-the-counter remedies. Geriatric specialists, also known as geriatricians, are specially trained to diagnose and treat older adults and, in particular, to care for people who have multiple health problems. Diseases and medications may have different effects on older people than they do on younger adults. A geriatrician is an expert in the medical conditions that are common in elders as well as the factors that may complicate care, such as frailty, depression, memory problems, and the side effects of multiple medications. Geriatric specialists are typically board-certified in family practice or internal medicine with additional training and certification in geriatric medicine. Dr. Landsverk is also board certified in palliative medicine. They often are part of a healthcare team that takes a holistic approach to healthcare, including nurses, physical therapists, nutritionists, and psychologists, all with special training or experience in caring for elders. Geriatricians are more likely to discuss end-of-life issues with patients and families and can help evaluate and make decisions about living situations, understanding the often subtle needs of an elder, not present in younger adults. When the complexity of dealing with multiple treatments and multiple healthcare professionals is too much for the patient and family. Also for a good overall check for older individuals for function, strength, screening for osteoporosis and decline in independence and financial capacity. 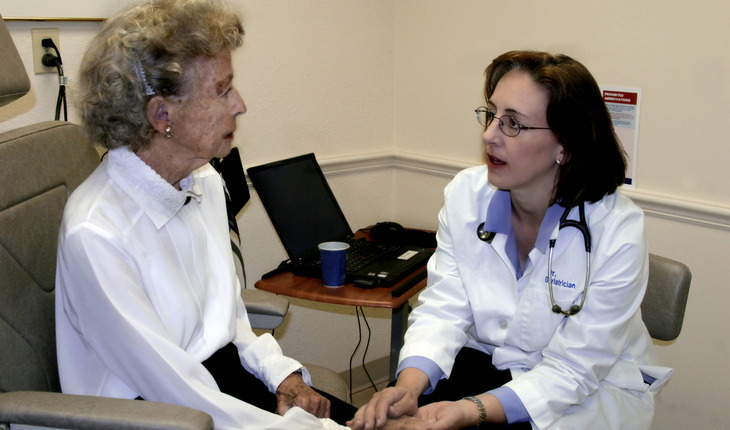 In general, the more complicated the care needed, particularly if the patient’s independence is threatened, the more likely it is that consulting a geriatrician will simplify and improve the situation for the patient and family. Age alone is not the primary indicator of an elder’s care requirement. But when the number of problems and medications increase and health status declines, careful management by an expert can help maintain the highest levels of functioning and quality of life.